Surgeworks » Interaction South America 2011, we were there! Our team talking about our company, our work, our client and each other. Interaction South America 2011, we were there! We’ve just arrived from an awesome conference that opened our minds to new ideas and point of views. 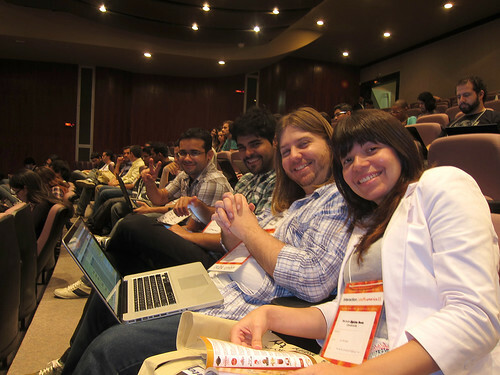 Yes, last week we were at Interaction South America (#ixdsa11), a conference with emphasis on Interaction Design, that happened in Belo Horizonte, MG, Brazil. The event had the presence of some of the most talented designers, engineers and architects of the Americas talking about Design Thinking, Service Design and Interaction Design. Although our company focus on mobile design/development and the event wasn’t specifically about the mobile world, we absorbed a lot of good concepts that we plan to include in our work methodology. The first day began with a brief introduction about the event and we quickly went to the workshops, where we could have a detailed vision about how Design Thinking and User Experience work and why they are so important on project planning. The Design Thinking workshop was led by Isabel Fróes, Psychologist and Interactive Telecommunications Program master. After she made a brief presentation of what it means, she gave the class an imaginary project and guided the participants through the phases of the process in order to reach three different results and make an analysis of them. The User Experience workshop, led by Walter Cybis, PhD in Production Engineering applied to Software Ergonomy, was focused on User Experience Monitoring. He went through the most common processes and techniques of user experience analysis and then taught how to use the most popular online tools to measure the user adaptivity to the interface suggested based on the statistics generated in the tests. Still on the first day, to finish our quest for relevant knowledge, we attended to Brian Rink’s talk about How to Build Creative Communities. Rink is a designer specialist in organizational transformation in IDEO and made a brilliant talk about how to make good use of interaction design and the importance of the designer on several activities identifying problems and developing creative and efficient solutions for those problems in order to achieve better results. On the second day of the conference we can highlight two lecturers: Denise Eler and Chloe Gottlieb. Denise Eler, Innovation and Design Thinking consultant, talked about the importance of investing more money in service improvement and less in merchandising and advertisement when what usually happens is the opposite. She showed several cases in which she worked as a consultant and also talked about the several job opportunities that are available to the designers. It was a very interesting talk focused on Service Design and innovation. Chloe Gottlieb, Creation Executive Director at RG/A, made a brilliant talk about Data Driven Design and how information is used to motivate people change their lifestyle. She cited examples like Nike+ that tracks people workout activities and how the data generated from these exercises is transformed into useful information for the consumers and how they can share it with their online communities. Finally, the third day of conference was enlightened with the talks of Bill Scott and Mike Kuniavsky. Bill Scott, Senior Director of Web Development at PayPal, featured the importance of the responsive design for services that need to be present on many different devices and how the design is influenced by different ways of interaction that are clearly visible between web, mobile and TV. Mike Kuniavsky, designer and entrepreneur, opened our eyes to an interesting aspect of how we see products and services nowadays. He said we were habituated to buy products that matters to us as products, and now what really matters is the service. For example: people wouldn’t buy a smartphone only by its beauty or quality but mainly for the services that come with it such as internet, twitter, facebook ando so on. Things that go beyond the calling function. The conference itself was very interesting and we came back home with a lot of new ideas and concepts that we want to put into practice and incorporate in our services. Oh! Needless to say, our new tee made some buzz within the people who went to the conference. Some asked if we were selling it but we were giving it away to some lucky ones that came to ask.